1. Saute the pancetta in a heavy large frying pan over medium heat until almost crisp, about 5 minutes. Add garlic and red pepper and saute another 5 minutes until soft. 2. When the red pepper mixture is cooled, add ricotta cheese, parmesan cheese, salt and pepper. 3. In the middle of one ravioli wrapper, put 1 -1/2 teaspoon of red pepper and cheese mixture. Brush the edge of ravioli with water and cover it with another wrapper. Seal two wrappers really well and make sure that air is out completely. 4. Boil the water and add some salt. 5. While boiling the water, heat the olive oil and saute the garlic slice for a minute. Add the chopped chard and saute for another 3-5 minutes soft. 6. Add butter and heat until the butter gets slightly browned. 7. Cook the ravioli for about 5 minutes. Then scoop out with slotted spoon and dump into the sauce. 8. 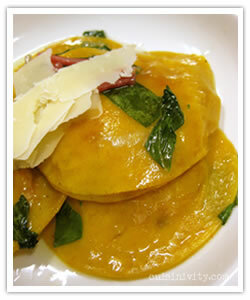 Gently fold ravioli into the sauce and plate. Garnish with graded parmesan cheese on top.